One million out on 10 July? Abdel Fatah El-Sisi has won the Egyptian presidential elections and will become the next head of state. El-Sisi, the senior general in the Egyptian armed forces and former Defence Secretary, won over 90% of the vote in an election involved mass intimidation by police and crack-downs on opposition activists and protesters. The election was the first to take place since the military coup against the Muslim Brotherhood government in July 2013. Teaching staff at Lambeth College began an all-out strike on 3 June 2014. The workers are fighting new contracts which attack pay and conditions and which would affect all new workers and create a two-tier workforce at the college. These are contracts that college bosses are looking to impose across the further education sector. Picket lines will be at all three college sites, and both of the college unions are encouraging solidarity visits from local students and workers. Doncaster Care UK workers struck for 14 days in May in a fight against a 50% cuts in wages and massive reductions in sick pay. 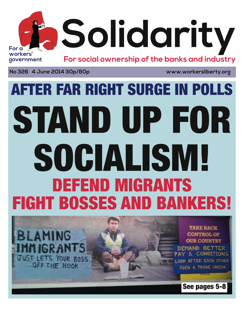 Workers’ Liberty members attended the “Solidarity with the Antifascist Resistance in Ukraine” meeting on 4 June, organised by the SOAS Marxist Society (Socialist Appeal). On the panel were Russian leftist Boris Kagarlitsky, Sergei Kirichuk from the Stalinist Borotba via Skype, Richard Brenner from Workers’ Power, Lindsey German from Counterfire, Andrew Murray from the Communist Party of Britain, and Alan Woods from Socialist Appeal. It was chaired by Joy McCready, a member of Left Unity. The AWL believes that socialist organisations must be the “memory of the working class”. A big part of our job is to preserve, rediscover, discuss and spread the lessons and inspiration of past struggles, victorious and defeated. Our annual event, Ideas for Freedom (3-6 July), will include many discussions on working-class history, with a focus on the First World War and the 1984-5 Miners’ Strike. Since 23 May, debate has raged among economists about an attempt by journalists on the Financial Times to refute the claim by Thomas Piketty, in his best-seller Capital in the 21st Century, that wealth inequality is rising and likely to continue to rise in the USA and Europe. Most economists, even quite conservative ones, reckon that Piketty has come best out of the row. Like millions of British television viewers, I have had many weekday evenings ruined by Kirstie Allsopp, self-satisfied co-presenter of the achingly tedious property programme “Location, Location, Location”. In the left’s comment on UKIP “surge” there is much about the anger and disenchantment with mainstream politics. It is true that there is an understandable revulsion against the politicians and parties whose policies and ideology accelerated the effects of the greatest economic crisis since the 1930s. Tom Walker talks about that anger in his article for Left Unity. Over one million workers could join a strike on 10 July against the public sector pay freeze. A set-piece confrontation between public sector trade unions and the government could help reignite wider resistance to the Coalition, and galvanise workers’ confidence. The National Union of Teachers already has a legal ballot mandate and says it will join a 10 July strike. The Fire Brigades Union is another possible participant.